Once your Magento e-commerce website is up and running, employing key strategies will help you get the most from your investment. At Harris Web Works, we apply best practices gleaned from 10+ years of working with Magento – to help your online business grow. In addition to developing your custom Magento website, we can provide strategic consultation, ongoing site management services, hosting, and more. Applying best practices and knowing system nuances is key to a Magento website’s success. While this robust e-commerce platform can help your business soar, it can be daunting to administer. That’s why we’re here! 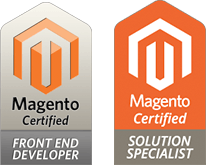 Our Magento-Certified CT-based team can administer the site for you. You’ll benefit from our vast experience and proficiency using Magento for a wide range of B2C and B2B retailers. In addition to building and managing sites, we provide Managed Hosting, where we take full responsibility for the upkeep of the website, including server, application, templates and content functionality. We manage all back-end and front-end technologies to keep the site running smoothly, and respond promptly to any issues that may arise. Whether it’s building a new e-commerce site or updating an existing one, we’ll be your partner for technical, creative, content development, search engine optimization needs, and marketing. Our goal is to anticipate needs and potential pitfalls, and to help you keep the site fresh and ahead of the competition. Contact us at 203.535.1631 or via this form to discuss getting the most of your Magento website.